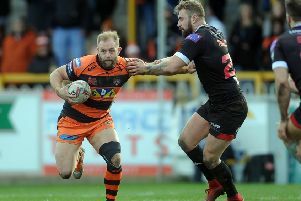 Castleford Tigers have come out against the Rugby League’s new marquee player rule with chief executive Steve Gill fearing it will only benefit the top five clubs, leaving teams like the Tigers simply making up the numbers. Yesterday all Super League clubs took a vote resulting in the proposal to introduce the marquee player rule being approved. The new rule will provide a dispensation under the salary cap rules for each club to sign a marquee player from the 2016 season onwards. Under the terms of the salary cap rule amendment, clubs will be entitled to sign one marquee player who will have a notional value on their salary cap register of either £100,000 if club trained or £175,000 if non-club trained. Gill feels that this is a step in the wrong direction for Super League. He said: “My view and the club’s view, was not to support the marquee signing proposal. “We felt the extra income we had received through the Sky monies had given us a sustainable business plan that would help us compete at the highest level and on a level playing field. “I fully understand the need to retain our home talent from the NRL and Rugby Union, however I do feel as though we will end up with once again the top five clubs winning everything and the others just making up the numbers. Tigers head coach Daryl Powell also remains unsure on the new rule. He said: “I’m not sure it’s something we needed to do having got a competition that looks like it’s got a bit of parity. “I do think we have a strong competition at the moment that is tough to call.